Accounting for 20% of the total Greek wine production, Crete has been referred to as the country’s sleeping giant. Historically the quantity of wine produced has been more impressive than the quality, with many large cooperative cellars turning out decent but unexceptional wines for local and mainland consumption. Indigenous grape varieties are a strength, with only modest incursion from ‘international’ varieties, but too often these were harvested with very high yields and poor quality. An outbreak of Phylloxera in the 1970s added to the problems of those few wineries looking to break the mould and create high quality Cretan wine estates, bottling and marketing wines for the world market. Principle amongst these was Lyrarakis, a family wine business established in 1966 and soon to become a leader of the quality wine movement on the island. 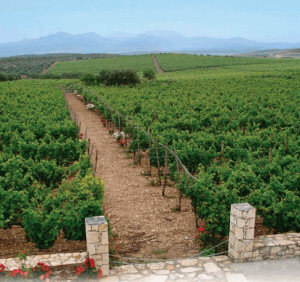 Concentrating on local varieties like Vilana for white wines and the red wine grapes Kotsifali and Mandilaria, their vineyards (right) near Heraklion in the mountainous village of Alagni comprise 14 hectares of gravelly soils on a limestone base, planted at an average altitude of 550 meters. Since the late eighties their focus has been on rare Cretan varieties, particularly the white wine varieties Dafni and Plyto that they have more or less saved from extinction. White Muscat and Sauvignon Blanc are also grown for white wines, whilst as well as the local Kotsifali and Mandilari, Black Muscat, Syrah, Merlot and Cabernet Sauvignon are grown for their rosé and red wines. Berry Bros & Rudd has recently started importing some of the domaine’s wines, but not the full portfolio reviewed here. Hopefully the all may appear at some point as quality is undoubtedly high, and the wines have plenty of interest including a sweet ‘Malvasia’, actually made from sun-dried Plyto, Dafni, Vidiano and Vilana. See all UK stockists on wine-searcher. An aromatic blend of Muscat, Vilana and Sauvignon Blanc, from higher altitude vineyards with a northern exposition to attain the coolest conditions. The Muscat dominates with its top notes of flowers, geranium leaf and gentle herbaceousness, beneath lies some cool white fruit. In the mouth it’s a striking, modern wine, the Muscat again making its presence felt with lots of crunch and citrus, super crisp and dashing stuff with the finish clean as a whistle. Another seafood banker. 88/100. Plyto is a Cretan variety that was at one time the best-known grape of the island, though its plantings have been in steep decline. Family vine-grower Manolis Lyrarakis has preserved and nurtured the variety quite extensively on the family estate. Fine, if slightly generic nose with lemon and a touch of pear and apple fruit, but clean and inviting. Very dry on the palate, underripe apple and lemon dominate here too, but it is very nicely pitched, with some weight on the mid-palate and the cool, clear core of pithy acidity pushing the finish along. 87/100. No oak here (‘inox’ means stainless steel tanks were used), in a pale-coloured wine with that lovely Assyrtiko fusion of leafy herbs, crunchy apple and salty minerals. It is very expressive and inviting, and on the delivers a lovely mouthful too: it has some weight, spice and texture despite its clarity, a broad pear and apple juicy fruit sweetness being overtaken by citrus-fresh, lemon peel acidity into the finish. Delightful fish and seafood-friendly stuff, would be great with some salt and pepper squid maybe. 88/100. Armi, meaning top of a mountainside in a Cretan, is the 500 metres altitude location for this vineyard. From rocky soils and with a windy exposition, this cool site is said to suit the aromatic Thrapsathiri variety. It has a very appealing nose, with ripe melon and orchard fruits, perhaps a little more character than the Plyto, with a touch of oatmeal too. On the palate it is ripe and round, with a bit of texture giving it lovely mouthfeel, and quite fat lemony and bright apple fruit to the fore. Acidity is good, and this has concentration and a bit of spicy substance. 89/100. Barrel-fermented and made from the indigenous Vidiano, this comes from an unirrigated, low-yielding vineyard at an altitude of 610 metres. Pouring a pale yellow colour, this offers aromas of gentle nuttiness and apple fruit, but it is all fairly discreet and low key. On the palate there’s a really pleasing sweetness and ripeness to the fruit; the juicy apple is there, but it hints at more tropical tones before some of that gently toasty oak influence adds weight and spiciness. The acid comes through too, cutting the concentrated fruit in a very intense wine that is in some ways Burgundian. Concentrated and impressive. 91/100. There’s no information on the Lyrarakis web site and this label is only in Greek, apart from the legend “Wine from old white vine trees,” so I am guessing this is some of the older indigenous grapes grown in the region of Fourfouras village. It has a deep colour, quite a buttercup yellow, with attractively earthy, gently oxidised aromas. I wonder if this has been made in a traditional, oxidative way. It is buttery and appealing, and onto the palate it has honey and vanilla, a buttery richness and some very sweet fruit, with a big core of intense citrus acidity. Lovely and traditional stuff, that’s out of sync with crunchily reductive styles, but I thought it had bags of flavour and personality reminding me of some wines I’ve tasted in Cyprus and Georgia of this style. 89/100. This 50cl of non-vintage sweet wine comes in a tall elegant bottle, and whilst the name suggests otherwise, it is apparently a blend of Plyto, Dafni, Vidiano and Vilana grapes, dried in the sun for nine days and aged for one year in new oak barrels. The colour is a deep, burnished gold and the nose is an intriguing amalgam of glycerine and herbs, with fat lemony fruit and edges of caramelised orange or apricot. On the palate that honey and glycerine character is there, and this does have a mellow, rich fruitiness, but it is medium-bodied rather than heavy, and the clarity of the citrus fruit and acidity is good. More honey and a touch of buttered toast fill out the finish, but the low alcohol (11.5% ABV) and core of acid keep it fresh. 90/100. This was brought in by Berry Bros, but is currently showing as out of stock. The grapes are not specified, but the red in this range is made from Kotsifali, Mandilari and Syrah, so I would guess this may be the same. It has a very dark colour, more of a light red, and a vinous nose showing cherry and some leafy, savoury notes. On the palate it is a very well-balanced wine, with a solidity to the berry fruit and gentle tannins and spice playing against good acidity. 87/100. A blend of the indigenous Kotsifali and Mandilari varieties with Syrah, all grown in higher altitude vineyards with a northern exposure. The colour is a bold crimson, and the nose is very inviting, showing creaminess and a touch of vanilla, but also a smooth, juicy-ripe black fruit. There’s a little hint of spice too. On the palate this has a bit of grip, with good acidity and tight tannins, the fruit blackcurranty, but with a sinewy, chewy density. Staying linear and focused, this finishes with a gravelly substance that would match some grilled meat well. 88/100. Berry Bros retailed the 2009 vintage of this wine for around £10. Around 70% of the blend is Syrah in this wine, a bronze medal winner in the 2011 Decanter awards. A rich ruby colour showing a hint of warmth, this has a deliciously spicy and peppery nose that is very Syrah, with gamy edges and a touch of underlying vanilla. On the palate it is very nicely pitched, the black and juicier, red berry fruit to the fore and plenty of dry extract giving a mouth-coating character in the finish, though the sweetness of the fruit persists. 89/100. Symbolo (or ideogram 131 if you prefer, the symbol on the label signifies the concept of wine in two ancient scripts: Linear B and Cretan Hieroglyphic) is an unspecified blend made from tiny quantities of specially selected grapes, aged for 15 months in oak casks. It is the only release from Lyrarakis of this wine so far and they say “who knows,” when the next one will be released: they await the perfect vintage. Dense in colour it really does have a beautiful nose, layered with graphite, pepper and hinting at something floral, with a deep pool of black fruit beneath. On the palate it has lovely balance. There’s a core of creamy black fruit running through this, but complex layers of game, minerals and tobacco-like spice are there too, along with firm, grippy tannins and a rasp of acidity. Despite a modest 13% alcohol it is powerful, heady stuff that Lyrarakis thinks will age elegantly. 92/100.